I purchased my Switch with grey Joy-Cons, which I came to regret over time. The blue and red Joy-Cons give the Nintendo Switch an iconic look akin to the Gamecube purple. Unfortunately, the blue and red Joy-Con set is frequently out-of-stock and also expensive. The consequence of fitting all those gyros and sensors into the controllers is $80. There is, however, a cheaper way to decorate my Joy-Cons: silicone covers. Silicone joy-con covers are popular and all over Amazon. They come in a variety of styles and even sport an ergonomic shape for comfort. I purchased a red & blue pair of Mayskey Joy-Con Gel Guards for $8 because it had positive reviews. Truthfully, I could’ve picked up a set from anyone. When I got into PC gaming, I realized I needed a better mouse for gaming. I usually play Counter Strike: Global Offensive, but I also play RPG games extensively and I wanted a mouse that would be accurate, and hold up to my abuse. I had been using a cheap IBM mouse up until that point with a scroll wheel that was grounded down so much from usage that it was smoother than the floor! The mouse had a decent back to it and a moderate downward slope to it so I wanted to maintain that shape in the next mouse. I am a person who likes having options, regardless if I decide to take them so I wanted to have a mouse that would have lots of buttons and functions. I viewed various mice that ranged from the Logitech to Cooler Master and Blue Cobra, but I finally decided on the Perixx MX-2000 gaming mouse with 11 buttons and DPI switch. My old IBM Mouse on the left, the Perrix on the right. The mouse itself is really comfortable and economic. I play a claw grip style, which means that I arch my index, middle and ring finger on the left, middle, and right button respectively. The mouse works very well for claw grip players, but I feel it would be perfectly fine for palm grip players, a grip that essentially requires the user to place their palm on the mouse and let their hand naturally grip the mouse. My thumb comfortably rests on the accompanying thumb rest that has a button at the base of the rest. It is placed in such a way that it is easy to click, but only if one wants to. It is tough to ‘accidentally’ click it. There are two buttons that are above the thumb rest on the side of the mouse that are traditionally for the “forward” and “backward” commands when in a browser or Windows Explorer to go to a previous page. The right side of the mouse has a button that is placed parallel to the forward button that is easy to reach with my ring finger as a claw grip player. Palm grip players would find it easy to click with their pinky finger when needed, but I have that button programmed to “F5” which is the refresh command when within a browser. The scroll wheel believe or not has 3 button functions. You can click on the scroll wheel for one function, tilt it to the left for another function, and tilt it to the right for the third and final function. At first, I thought the tilt on the scroll wheel would get in the way of me using it,, but it turns out it stays out of the way until only when needed. Last, but not least, the mouse also has DPI adjustment buttons. DPI, which stands for dots per inch, is how many dots the mouse ‘understands’ per inch the mouse itself moves. A high DPI means the mouse moves fast, whereas a lower DPI means the mouse speed is lower. These buttons are placed in a slightly inconvenient manner behind the scroll wheel. If they were about a millimeter or so closer to the scroll wheel it would be easier to reach. The buttons as is are easy to press, but it would be convenient for the user. Otherwise, all the buttons feel very natural and responsive, all in all making it a great mouse to use physically. Now for the fun stuff, the program. What makes this mouse so useful to me is the software that comes with it. Each of the 11 buttons on the mouse can be reprogrammed to the users liking. The program lets the user switch out the default functions of the mouse to what the user wants. You can change a button to a basic function such as forwards, backwards, double click, and menu, or you can change it to media hotkey such as play or stop. In addition to that, basic edit functions such as copy and paste, as well as more advanced functions including run, close window, Lock PC and LED Color Switch. Probably most important for gamers is the Single Key and Macro buttons which allow users to create shortcuts that can be bound to their keys. These come in handy for me a lot when I play games such as Magicka, a game that requires you to make spells via key combinations that range across 8 keys on the keyboard. MMO players and MOBA players also benefit from this when they play their respective games because it makes them more efficient as players. The program also lets you change little things as well such as the color of the LED in the mouse, the sensitivity of the scroll wheel and the double click speed. You will not have to worry about changing the button commands every two seconds since the mouse can handle up to five profiles. This means that you can have a profile just for browsing the internet and casual use, as well as profiles for your favorite games. On last point to touch on is the wire itself. The wire is braided, which means that it cannot get tangled up and wrapped up within itself like most other cables do. This for me is a fantastic feature since it makes it easier to take the mouse places without having to waste time untangling the cable once I reach my destination. This mouse overall is a great value purchase and it has not failed me so far in the six months I have owned it. It is built to last in my opinion, and although the company is not well known or well advertised, I will be sure to buy more products from this company if the occasion arises. The mouse is quite comfortable and the accompanying program is quite useful and manageable. I would easily recommend this mouse for anyone who is into gaming or wants a comfortable mouse to use for their desktop or laptop. Valve has given their final announcement of their Steam Box trilogy, with the last being about Steam’s new controller, simply titled the “Steam Controller”. The features it packs are very enticing even for a mouse and keyboard gamer like me, and that is exactly what they were going for. What is Valve really trying to do? Valve has been showing much interest in bringing entertainment to the TV, even before the arrival of SteamOS. The TV-friendly Big Picture mode was a huge indication that something bigger was on the way, although the text input method used to chat with friends is clearly denoted in the picture of the controller above. They’ve had this all planned from the start. There is no doubt that console gaming is still a very real thing, with PC gaming on the rise. Now, Valve is doing a very risky thing being that they are literally trying to turn PC’s into what we define as a “game console”. Is the Steam Box a console, or a PC, or both? Well it runs Linux and accepts mice and keyboard input, so that makes it a computer. On the other hand, it also interfaces with controllers and plugs into TV’s. What I’m trying to say is, Valve is trying to turn console gamers (that being Xbox 360 and PS3 owners) into PC gamers without even realize that they’re gaming on the PC. A person who may have never even considered buying a computer for gaming may have had their mind turned around by the fact that they could buy this box that could be plugged into their TV, and you can use your already existing Xbox 360 controller on it, or just buy Valve’s interesting new controller. I never would have even conceptualized the thought of turning the PC into a console-like machine, but somehow I think that Valve is going to pull it off. What Could Valve’s Final Steam Box Annoucement Be? Valve has surprised the gaming world with a whole new way to play games and interact with your TV, announcing Steam Box paired with their new operating system based on Linux, SteamOS. Being that we have seen “O” and “[O ]”, it is likely that the next annoucement “O+O” is some form of hardware. Valve has likely realized that many of the people planning on buying their Steam Box are already PC gamers. Knowing how much us PC gamers love our modular gaming machine, it is likely that components within the Steam Box, such as video card and memory, will be interchangeable. With that said, part of me feels that Valve has already worked with AMD and Nvidia to push for Linux driver support, being that most of these Linux drivers are currently ready to use. All that’s left now is to call for the video card manufacturers to create custom video cards in the same way that custom CLEVO and Sager laptops do. I have a (removable) 7970M GPU inside my laptop, and upon opening it, I found that the graphics card really isn’t that big at all, and this thing can push more power than even my desktop sporting a Radeon 6850. Another smart move would be to create a driver utility that can easily and automatically uninstall and install drivers depending on the inserted video card, this way when the not-so-techy people buy Steam Box as more of a console, they can upgrade their box at ease. Valve games already support the Xbox 360 controller either natively or by messing with hidden configuration files, and games such as Portal 2 and Counter-Strike: Global Offensive natively support the Razer Hydra motion-controller. Keeping that in mind, the other thing that Valve may possibly announce today is their wide support for controllers, and more likely the creation of their own modular one. I don’t exactly see how a modular controller could work, but being the nature of the many different kinds of gaming mice, keyboard, monitors and other peripherals, I guess we’ll have to wait and see. My roommate picked up this game on the last day of the Steam Summer Sale. He purchased the two pack and gifted me the spare copy cause I’ve gifted him various games over the months. We were both super excited to play this game because we are huge fans of difficult platformer games like Super Meat Boy, Giana Sisters: Twisted Dreams etc. We finally got around to playing it, and I invested a good couple of hours in the game. These are my thoughts. This is essentially a two player game. You can play the game single player if you chose, but you will be provided with the same levels. The levels themselves are colorful, and the obstacles can be difficult t navigate through at times. 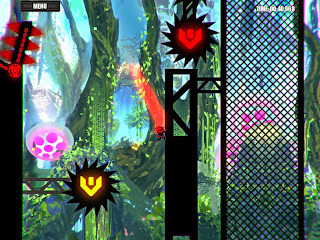 Throughout the level, there are a couple of power ups such as double jump and speed up. When playing two player, there is an extra power up that flips your opponent’s screen horizontally which can disorient them for a short amount of time. I found the power ups to be quite basic, although I will admit I liked the speed up power up because of how fast your character could physically run. The controls were similar to every other platformer I have played using my Xbox 360 Controller, except for the “X” button. 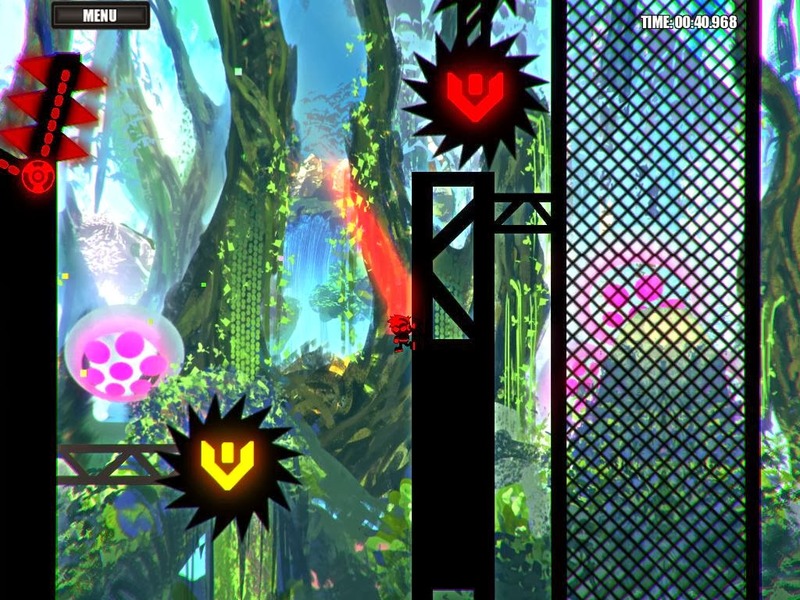 In Rush Bros, there are certain switches in game that require the player to press the X button rapidly to activate them. I felt the button placement was awkward, but you can re map the controller in game to your own preferences. What initially interested me about the game was that the obstacles and items within the game moved in rhythm with the background music. Watching blades move in sync with the in game music is fun to watch, on the rare occasion the blades and obstacles sync with the game’s music. It added a sense of change and variety because they were songs that I was not familiar with, therefore the movement of the obstacles were unpredictable. Will all of that in mind, something about this game feels unpolished, almost to the point where it feels incomplete. Despite the very eccentric colors and oddly shaped weapons in the forefront, the backgrounds of the levels looked out of place, as if they were added last minute. During various playthroughs of the game, I found myself not even touching the spikes or other hazardous obstacles, yet dying and having to restart the full level. Another thing that I noticed, that personally saddened me was how there was no plot. I’m not saying EVERY game has to have a plot, but it would make the overall game so much better. Split screen was a bit disappointing for my roommate and I, but we were unsure as to what made it disappointing. I felt the game kind of threw us into the midst of things without any other information other than “Select a level.” The game doesn’t even mention any tips or tricks for the game. Within Rush Bros. you are able to slide and do a super jump, but unless you are clicking random buttons in game, you’d never know they existed. It’d help the overall game if the developers gave the option for a tutorial. The music selection process was also a bit iffy. The default soundtrack is very EDM like, and although some tracks stand out, the music gets very dry and repetitive fast. At one point, I just muted the game due to how boring the soundtrack became. 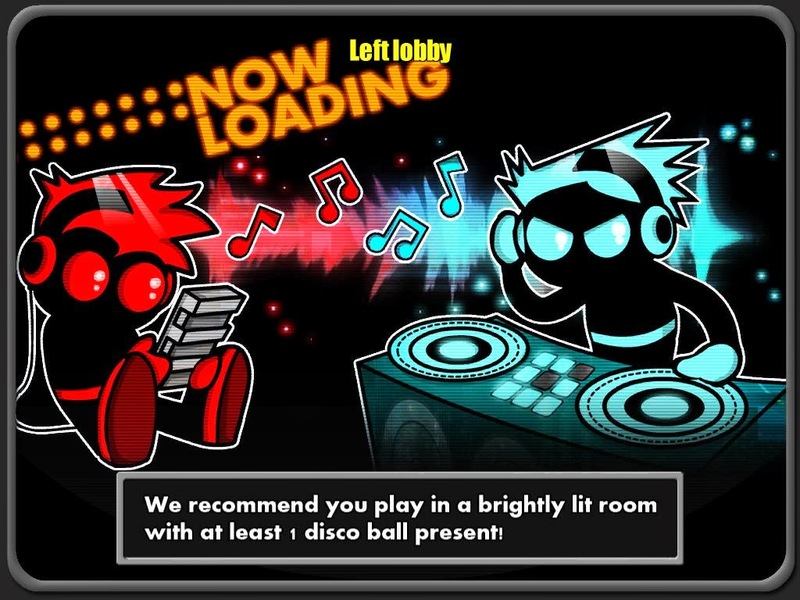 The game lets you play the music of your choice by letting you manually select what folder the game can access to play media. Whilst playing the various levels, the music will play. I was playing 60FPS just fine, but the second the song changed, the FPS dropped to 5 for a good five to ten seconds, thus effectively stuttering whatever action I was doing to the point of ruining my flow of movement. Also, if the song ends while you are still playing the level, it will not cycle to the next song. I played around with the settings a bit, but you have to manually change the song in game, thus causing the massive FPS drop I referenced before. Lastly, when you switch to the next level, the next song plays, as opposed to continuing from where the previous song left off. It was these little things that irked me as I played the game.